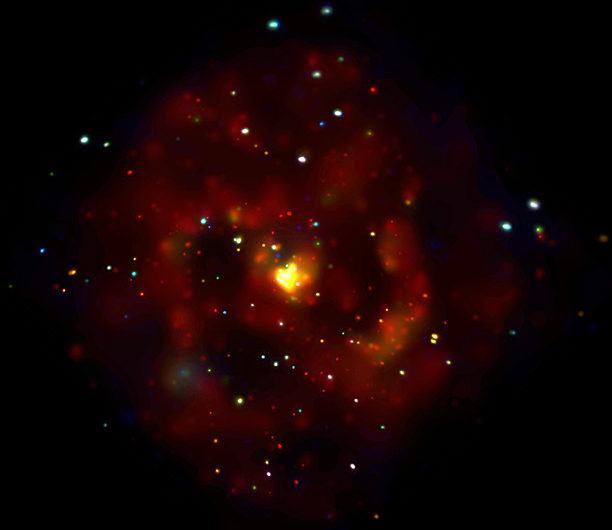 Chandra's image of M83 shows numerous point-like neutron star and black hole X-ray sources scattered throughout the disk of this spiral galaxy. The bright nuclear region of the galaxy glows prominently due to a burst of star formation that is estimated to have begun about 20 million years ago in the galaxy's time frame. The observation revealed that the nuclear region contains a much higher concentration of neutron stars and black holes than the rest of the galaxy. Also discovered was a cloud of 7 million-degree Celsius gas enveloping the nuclear region. 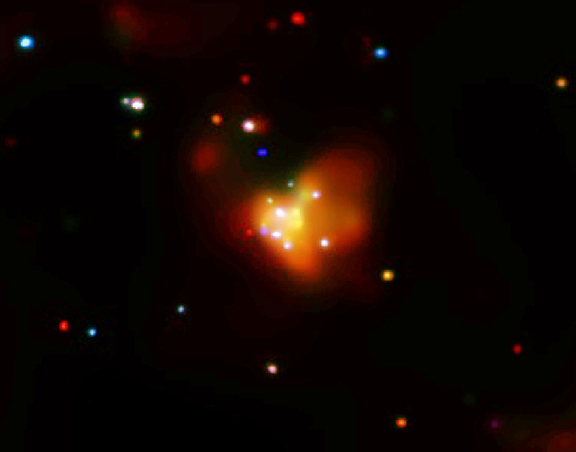 The picture that emerges is one of enhanced star formation in the nuclear region that has produced more massive stars, leading to more supernova explosions, neutron stars and black holes. This activity could also account for the hot gas cloud which shows evidence for an excess of carbon, neon, magnesium, silicon and sulfur atoms. Mass evaporating from massive stars, and the ejecta from supernovas have enriched the gas with carbon and other elements. Hot gas with a slightly lower temperature of 4 million degrees was observed along the spiral arms of the galaxy. This suggests that star formation may be occurring at a more sedate rate in the spiral arms, consistent with the observation of proportionately fewer bright point-like sources there compared to the nucleus. Coordinates (J2000) RA 13h 37m 00.80s | Dec -29° 51´ 58.60"